OTTAWA, CANADA — Karl Rove said Friday he’s not surprised that the Mueller report has apparently found no evidence of collusion between President Donald Trump and Russia. 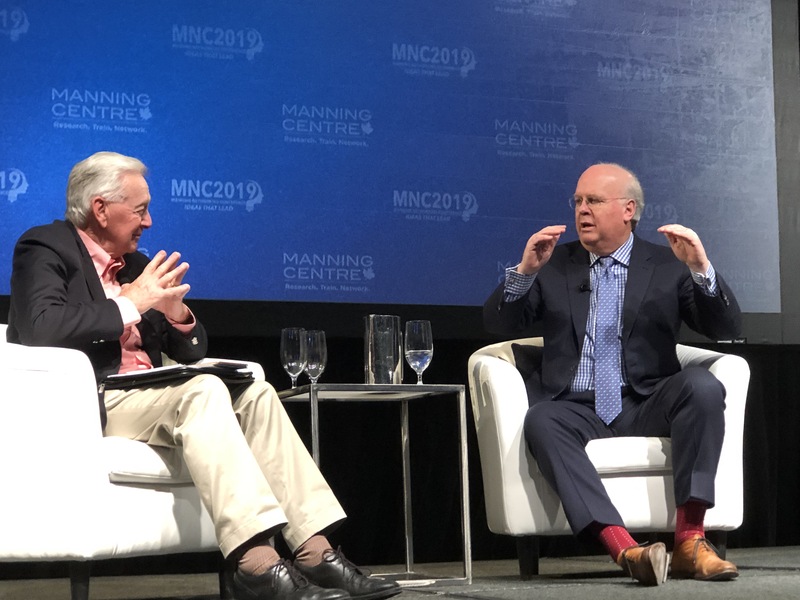 The former senior adviser and deputy chief of staff to President George W. Bush was speaking to 2,000 people at the Manning Networking Conference that brings together Canada’s conservative politicians, political action committees and opinion leaders every year. “Every campaign leaks … no campaign in my experience has leaked worse than the Donald Trump campaign: 2016 was like if you wanted to know who had gone to the restroom at 11 o’clock in the morning, somebody would tell you,” Rove quipped. Rove, who is known as “The Architect” for having masterminded Bush’s election victories, reserved his harshest words for former FBI Director James Comey. When asked if he thinks the Mueller report will still hurt Trump’s chances for re-election, Rove said the ball is in the president’s court. “I think it all depends upon how Trump reacts,” he said, suggesting that the chief executive should focus on his successful fiscal policies.